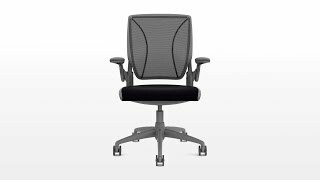 Seat depth adjustable between 15.7" - 18.25"
Seat height from floor Standard - 16" - 21.125"
Armrest height adjustable between 5" - 9.6"
The frame of the Humanscale Diffrient World Chair is available in black, white, or gray. 1-800-349-3839 before placing your order. Constructed from a blend of nylon, Cordura and elastic yarn, this four-way stretch textile offers a pleasing texture, while providing the extreme durability required for long-term use. This keyboard's split design promotes a more natural and ergo-friendly typing position. Mount a monitor weighing between 4.5 - 17.5 pounds, and adjust the height, depth, or lateral position with easy fingertip adjustment. A FREE $100 gift certificate toward an UPLIFT Desk - There's no better time to take the plunge to a height-adjustable desk! Gift certificate is good toward full two and three-leg UPLIFT Desks; this offer excludes scratch and dent models. Please note: There is a limit of one gift certificate or coupon per desk order.